Harrison Burt, president of T.H. Burt Corporation grew up in Chesterfield County Va. He was born in 1960 and has remained here all of his life. After graduating from Thomas Dale High School in 1978 Harrison continued working in construction as he had done through school. Following in the footsteps of his mother who was one of the first female real estate agents in the Tri-City area he attended school at night and became a Virginia licensed real estate agent in May of 1981. In the midst of the recession of the late seventies and early eighties Harrison decided to utilize his knowledge of residential construction and T.H. 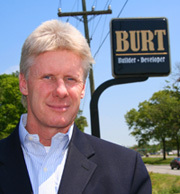 Burt Construction was born in 1982 and then incorporated in 1983 as T.H. Burt Corporation. He has created a multi-faceted real estate business. His companies are involved in real estate brokerage, land development, residential and commercial renovations and upfits, its core strength however is residential construction. Hundreds of families in Chesterfield, Colonial Heights, Hopewell and Prince George County, Va. have chosen T.H. Burt to build their new home. As a licensed real estate broker Harrison stays on top of the current trends and activities in the local and nationwide housing markets. He is an expert at financing and home design. Harrison designs many of the homes he builds. “If you can tell me what you want in your new home, I can both create it on paper and build it for you”. The creative side of this business is what he loves the most. “To meet with a client, listen to what is important to them in their new home, design it for them and then experience the joy it gives them as they watch it get built…..it just doesn’t get any better than that”. Check our the photos full size in our gallery. See for yourself the difference in luxury design, finishes and construction by T.H. Burt Homes. Have Property? Need a Builder?